﻿ Blog - Location numbering: how do you create a logical structure? Location numbering: how do you create a logical structure? For more efficient order processing, it is very important that locations in a warehouse are easy to find and this is what makes location signs so useful. Utilising location signs brings you one step closer to order picking that runs smoothly. By giving the location number a logical structure as well, there is even more to be gained in work efficiency. But how do you create a logical structure? It is important that location numbering is easy to understand. If this is not the case, everyone who has to navigate the warehouse will lose more time processing location information. The best way to ensure that navigation requires as little cognitive load as possible is by taking advantage of common cognitive processes. When a warehouse is being arranged, it is useful to carefully consider the location numbering beforehand. It is also handy to formulate a location number plan along with your warehouse plan. 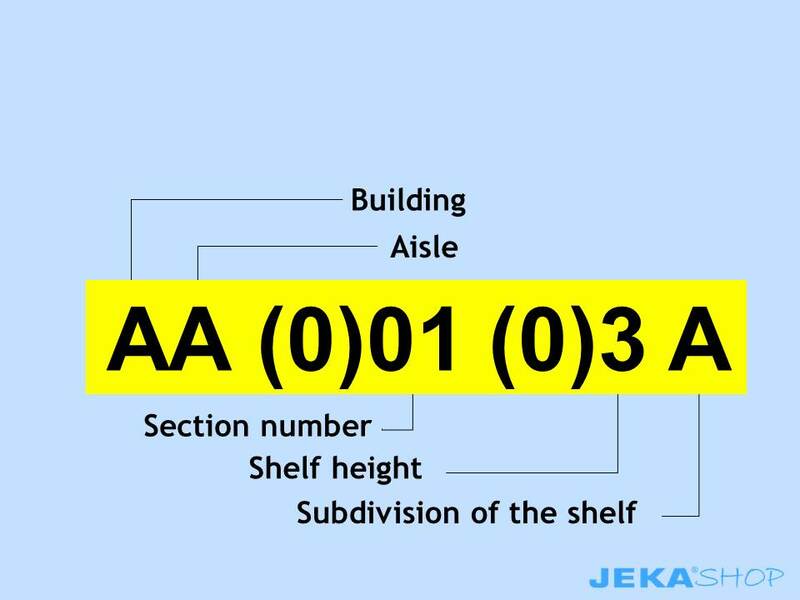 As soon as it is known which routes will be followed in the warehouse, the structure of the location numbers can take its cues from these routes. This ensures that no confusion or doubt arises when searching for a location, because the information will be interconnected. In this way, an order picker can always rely on a logical sequence. Information can be processed more quickly when less is provided at one time. This makes it well worth the effort to split the location numbers up into smaller parts, so that it is easier for order pickers to only read the part that they need. For this reason, location numbers are frequently divided into “chunks”. Each chunk represents a different part of the location. The chunks are often ordered largest to smallest. As a result, the first chunk indicates whether someone is in the proper corridor (building + corridor), the second chunk indicates the section, the third the height, and, finally, any subdivisions on the shelf. The format of the location numbers is also very important. This means that dashes or dots between the chunks should be deliberately avoided. These will be read and, in turn, will result in greater cognitive load. It is also crucial that the numbers are clearly legible. For this reason, you should ensure that they are sufficiently large and contrast with the background enough. By using different colours, the recognisability of a certain location can be increased even further. Colour acts as a powerful signal, which also makes it easy to process. It goes without saying that at JekaShop, you can find location labels in various colours. In addition to the methods mentioned above for having your warehouse layout be as efficient as possible, there are several other ways to limit errors during order picking. For instance, consider using a barcode label and/or a check digit.